SPARE THE ROD - SPOIL THE FISH! The school holidays are over for another 11 weeks which many local anglers will read and give a small sigh of relief. It is really positive to see during the holiday period the families hitting all the fishing hot spots along the Sunshine Coast, but the fish often flee the area upon the sight of kids, dogs, boogy boards and jetskis. It often takes a week or two for the waters to settle and for the fish to sense it's safe to return as there is a slim chance of a fluoro pink scoop net being waved frantically in their direction. If you love fishing in peace and quiet, then winter is the time for you, after the school holidays mind you. If new to the game then today you are in luck as this article will look at the first thing you will need to perfect your craft....a fishing rod! If you are a beginner, or are just chasing some more information; then read on! Finding the best rod suited to individual needs can be tricky. One of the first things that you need to do is decide where the majority of your fishing trips will be - beach, boat, bank, offshore, dams or off the rocks. What type of reel you use will also influence the type of rod you will need. If you use egg-beater or spinning reels, you will need a spin rod. If you prefer bait casting reels, you are going to need a bait caster rod and so on. Another thing that you will need to consider is what length is suitable for you. The longer the rod, the further your cast. However, shorter rods can often help improve your accuracy. In some circumstances you cannot use a long rod as overhead branches or the cabin height in your boat restricts casting a long rod. Keep in mind also transportation; no plane in Australia, let alone anywhere in the world will allow you to take a 13 foot single piece carbon infused beach rod, no matter how much you sweet talk the woman at the check-in desk. Many anglers believe that a solid one piece rod is the bee's knees when fishing in the surf, yet other say they prefer the flexibility of a two piece rod so they can pop it in a rod bag and take their favourite extension of their arm with them everywhere - even on a plane! Lastly, you need to consider what type of material you want your rod to be made of - this will influence the price of your rod hugely. Fibreglass rods are very sturdy and flexible, even though they are quite heavy. Fibreglass is old school and has been used in fishing rods since the 1950's. It's preferred by many anglers due to the price, however if buying new - they are very hard to find. Composite rods are lightweight and flexible but will not last as long. Graphite rods are the lightest material, but are also the easiest to break. If walking into a tackle store bewildered, ask for advice. Tackle experts can often use terminology that may sound like another dialect, so read on for a few hints as to what is meant by certain terms used for describing features of fishing rods. Action: As in light, medium and fast action. This describes how much of the rod deflects or bends when you put pressure on the tip. A fast action rod will bend in only the top third or less of the blank, a medium or moderate action will bend in the top half or so and a light action will bend starting in the lower third of the rod. Power: This describes the strength of the rod and its lifting power. When someone says this rod has a lot of backbone, they mean power. Power ratings are usually describes as heavy, medium, and light. Power is closely related to the line strength; heavier power rods will handle heavy line weights and lighter powers will be good for light lines. It is important to keep your line strength within the limits printed on the rod. If not you may find putting light line on a heavy power line will never catch a fish as it snaps quickly. Responsiveness: This is the ability of the entire rod to flex under load and release. Generally, the lighter the rod, especially the tip, the more responsive it will be. The better a rod's responsiveness is, gives the angler an ability to flick a more accurate cast. Graphite estuary all round rod: The Berkley Drop Shot 6'6" 2-4kg. All round fibre glass estuary rod: Wilson's Heritage 7'. All round Surf Fibre glass rod: Surecatch Big Field 12'. Hopefully now you will be able to walk into a tackle store with confidence and make an informed choice on the best rod for your needs. Until next time, tight lines! Noosa: Tailor and bream from north shore and Teewah Beach. A few good luderick off the rock walls in the lower reaches. Whiting to 750g from the frying pan, Woods Bay and Munna Point. Bream an Flathead in the lower river. Trevally and tailor at the back of Noosa Sound and in Woods Bay. 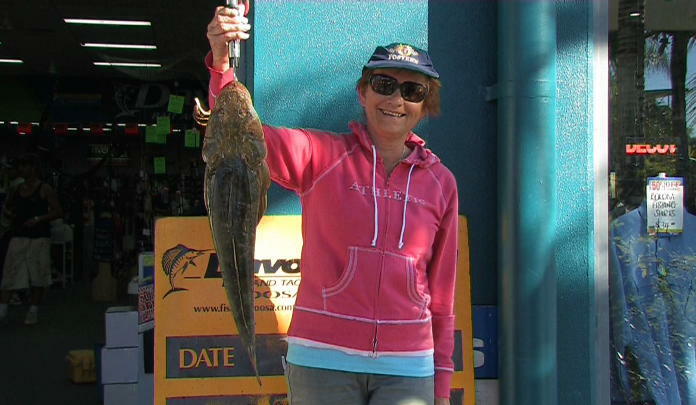 Maroochydore: Moses perch and snapper to 2kg from the 12 mile. Bream to 33cm and a few flathead from the sand bags. School jew and flathead along the bli bli stretch. Bream from the Cod Hole, Picnic point, Chambers Island and the river mouth. Kawana: Dart and tailor between access 28 and 32. Big schools of gar in the sand basin, the moorings and La Balsa wall. Bream and tailor fromt he mooring and the eastern rock wall. Plenty of quality bream scattered throughout the lower river. Flathead above McKenzies bridge. 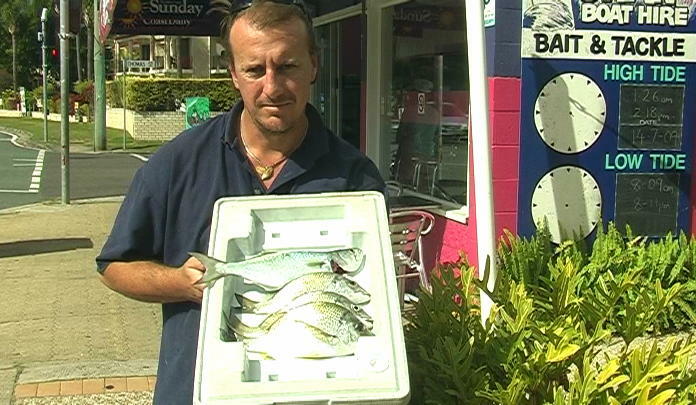 Caloundra: Trevally in Pelican Waters on small poppers. Flathead from the mouth of Bells Creek and in the bar. Flathead and bream in the Blue hole and off the military Jetty. Bream and school jew from Shelly Beach over night. 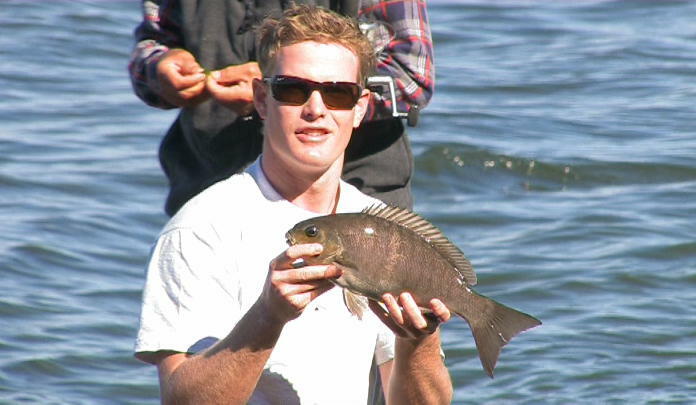 Rob Stokes was floating pilchards into the channel in the lower Mooloolah River, when he came up with several bream to 32cm and a chopper tailor. 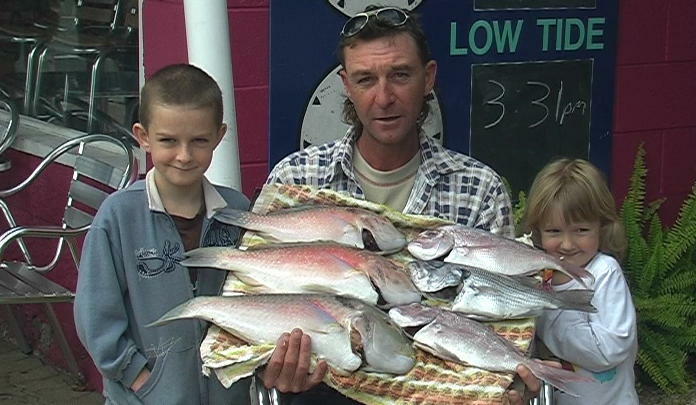 Darren Lloyd fished with his kids Casey and Cody east of Old Women Island recently for this tray of parrot, snapper and pearl perch.